Guess who found a look hidden in her computer that hasn't been shared over here yet! Me! I think this look is from late last year, and it was the result of playing around with some new stamping plates I ordered from Nicole Diary. It was one or two lighting setups ago so the colour is a bit off (sorry!) but the look is still pleasing to the eye imo. :) Let's focus on the design rather than the yellow tone everything has haha. For this look I used Ya Qin An Plate Y001 from Nicole Diary (which I also used for this DD mani). I just really like this design, I want to use it over and over! 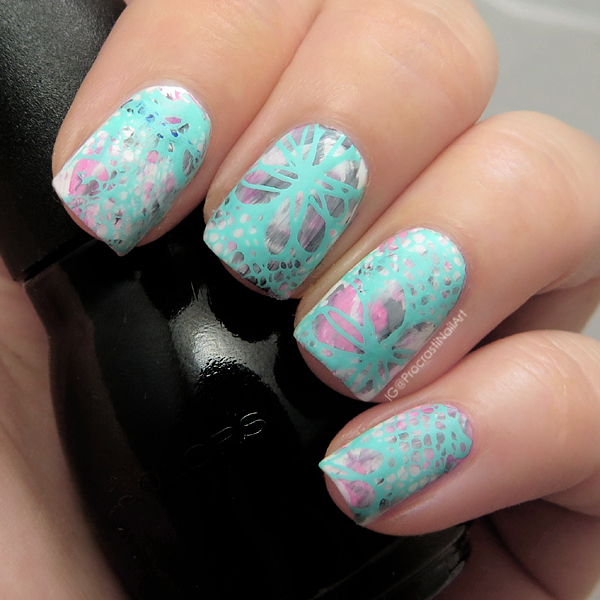 My stamping polish was Mundo de Unas Mint. The base for this one was interesting (a dry brush with a pink, black and white from Sinful Colors) because when I was done the base I was like: "This is way too bold a look to do stamping over with this design." So my solution was to create a sheer white by mixing Sinful Colors Snow Me White with some clear top coat and then doing a light wash of that polish over the base to tone it down. It did the job, so I stamped on my image and mattified the whole thing and voila! I like this colour combo though I really have to push myself more to use more unique combinations. I would like to challenge myself one month to do ALL my mani looks without black or white involved since I feel I lean on those shades way too much (because it's so easy!). Maybe that's a challenge for me for February? We'll see! Some wonderful stamping this is. I love the base so much!